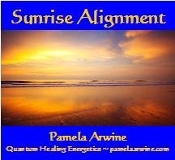 In 'Sunrise Alignment' (29 min) you'll learn to begin each day with clarity and a powerful intention. You will notice chronic issues and challenges beginning to dissolve and new channels opening up if you repeat this process every morning and 'Starlight Energetics' every night. Using 'Starlight Energetics' (15 min.) at the end of every day will help to keep your field clear, allowing more and more of your soul's energy to emerge. As you deeply surrender to Jesus Christ, the Christ Masters, the Holy Prophets and your own Soul and God Presence, deep healing will occur. Single CD. Total time 44 min.